World's most popular equine spreader since 1985: Model 27+ for 1-4 horse stables and 37+ for 4-6 horse stables, easy to operate, low loading height; 3 year warranty; pull with garden tractor, or ATV. Tough powder coated finish and available polyurethane lining. Available in standard, deluxe, and SS (super spreader stainless steel) versions. 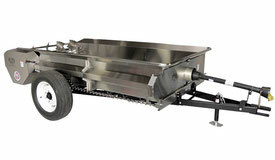 A mid-size equine spreader, model 57 for up to 10 horse stables, and 77 for up to 20 horse stables. Low sides make it suitable for hand or machine loading. Available in ground or PTO drive. Options include standard powder coat finish, rhino lining, and SS (stainless steel super spreader). Ground drive can be pulled by “Gator” type vehicles, or compact tractors. Model 97 for 20+ horse stables, and model 127 for 25+ horse stables with floor and T-rod apron chain. Suitable for organic vegetable producers and low input small farms. Available in ground or PTO drive, with 3 year warranty. Available with standard powder coat, rhino lining, or SS (stainless steel super spreader). 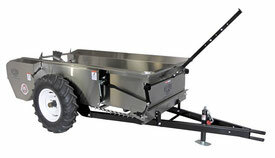 Need a compact manure spreader, but not sure how to decide what make and model to purchase? Is the design of the spreader proven? Spreaders that depend on gravity drop spreading can frequently clog up. This is especially true in our humid climate on the east coast. Rotary drum designs are awkward to load, and time required to spread may vary widely. Millcreek spreaders use a time proven basic design, similar to that used by commercial farm operations. How is the quality of the components? Millcreek spreader bodies are formed from heavy gauge steel, then chemically cleaned and powder coated. Powder coating stands up to corrosive salts present in bedding and manure much longer than painted steel, as verified by salt spray testing. An optional Rhino urethane lining provides additional protection inside the body. 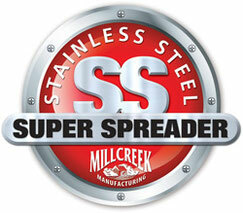 Stainless steel super spreaders are warrantied to provide lifetime corrosion protection. A 3 year overall warranty and lifetime floor warranty demonstrates the confidence that the manufacturer places in the quality of their spreaders. Shorter warranties from other manufacturers imply less confidence in the long term durability of their spreaders. Is the spreader easy to use? Millcreek spreaders’ low, flared sides and extended control levers make the spreaders easy to load, engage, and spread with. The dollywheel jack can be adjusted to leave the hitch at just the right height to hitch to, and makes hitching to your tractor or ATV a snap. All bearings are self lubricating, no grease fittings to worry about! Competitor's spreaders have grease fittings, and continued use without periodic greasing will result in an expensive and time consuming breakdown. What about local and manufacturer support? Does the spreader come with a complete parts list? Does the local dealer maintain a spare parts inventory? Is the spreader produced at a manufacturer owned factory, or is it manufactured by a competitor? If you need support, can you speak directly to a technical support person at the factory? What size spreader do you need? Consider: How many stalls do you have to clean? How many trips to the field are you willing to make? What will you use as a tow vehicle? How wide are your barn doors, aisles and stall doors? Do you need to move the spreader by hand? How much land do you have available on which to spread? Where will the spreader be stored? Countryside Equipment is an authorized dealer for Millcreek Manufacturing. We are a family owned business selling US made quality products and providing ongoing service and support. Since 1997, we've sold and serviced equipment in Central Virginia, from the Chesapeake Bay to the Shenandoah Valley and beyond. Copyright © 2017 Countryside Equipment, Inc.